This school term is keeping me very busy. I haven’t stopped creating recipes and taking pictures, but the actual process of synthesizing posts has been on pause. Finally, several weeks in, I have been finding a more regular cadence for handling studies. The pleasant spring weather is getting me outside more with my boys. I did not realize it was possible to go through so many bottles of bubbles. Also, we had a chance to go the zoo this weekend. The preschooler is still talking about how much he liked the trip and informing me that bats fly. Learning is such an exhilarating thing. On the recipe front, I have been diving deep into the science of vegan baking. The Earth Balance vegan cupcake challenge was a strong motivating factor in this latest obsession. We ate vanilla avocado cupcakes for almost two weeks while I tweaked the recipe to taste. Mattie over at veganbaking.net is my baking hero. I learned a lot from the vegan baking tips and tricks blog posts. It was helpful to first understand the chemistry and process of traditional cake ingredients coalesce proper substitution and recreation of plant based recipes. If you are working on honing your baking know how or love the science of things, check it out. On to the real meat beans of the post. 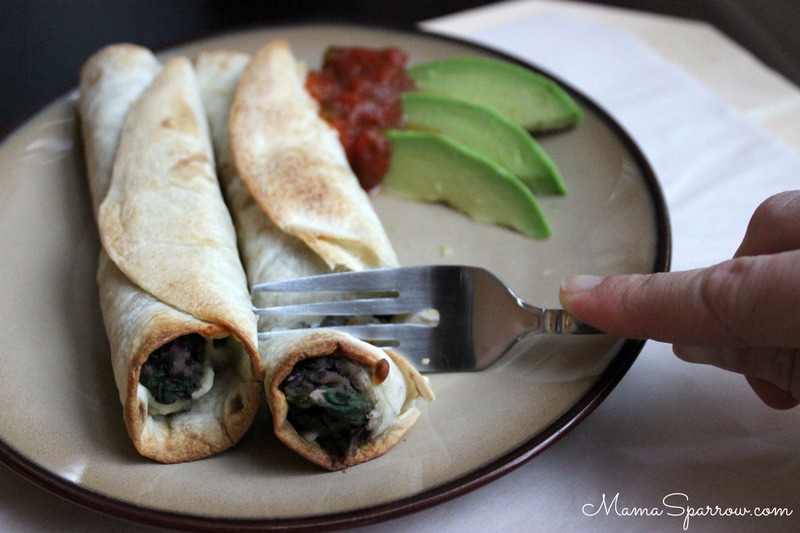 I wanted to share with you my favorite flauta recipe – black bean spinach. First of all, I love making these because they are easy to make and the whole family loves them. It is a bonus to have a few leftovers from dinner because they reheat well and are easy to bring for pack meals. Fresh out of the oven I love to smother mine in salsa. They are also good with avocado, rice, or a salad. Enjoy and please share a picture or comment of how you choose to serve your flautas. Smashed black beans and wilted spinach are seasoned with warm spices and topped with melty mexican cheese. All the good ness is delivered in a crisped flour tortilla begging to be smothered in your favorite salsa. Place black beans in a large saucepan with a few splashes of vegetable stock. Season the beans with garlic powder, chili powder, cumin, paprika and salt. Use a potato masher to mash the beans as they cook. Continue to add stock through mashing process to achieve a textured paste like refried beans. Once beans are mashed, toss the spinach into the pot with the beans. Cook until the spinach is wilted. Stir often during the wilting process. Remove the pan from the heat when spinach has wilted. Stir the bean and spinach mixture so they are well mixed. Spoon about 1 Tablespoon of the bean/spinach mix onto the left side of the tortilla in a vertical line. Sprinkle cheese over the bean mix. Roll the tortilla up starting at the left side, tucking the beans and cheese into the middle of the roll. Place the tortilla roll seam side down on lightly oiled baking sheet. Repeat with remaining tortillas and mix. Rub the tops of the prepared flautas with a bit of oil before placing in oven to bake. Bake for 5 minutes, rotate the flautas to seam side up and bake another 5 minutes until the outsides are crispy. This spring I have been obsessing over citrus fruit. I made my first curd a couple of months ago. The recipe was from 101 Cookbooks. Heidi’s grapefruit and ginger curd sounded so amazing, I was compelled to try making it without having a clue what curd was or how to eat it. Anyhow, I decided to double the recipe as I had a good bit of juice from the grapefruits. As I reached the end of the process and had the curd over the double boiler, I knew something was wrong. I had forgotten to double the eggs. Needless to say, with a little patience and quick work I was able to save that first batch of curd. I felt like I had conquered a challenge. 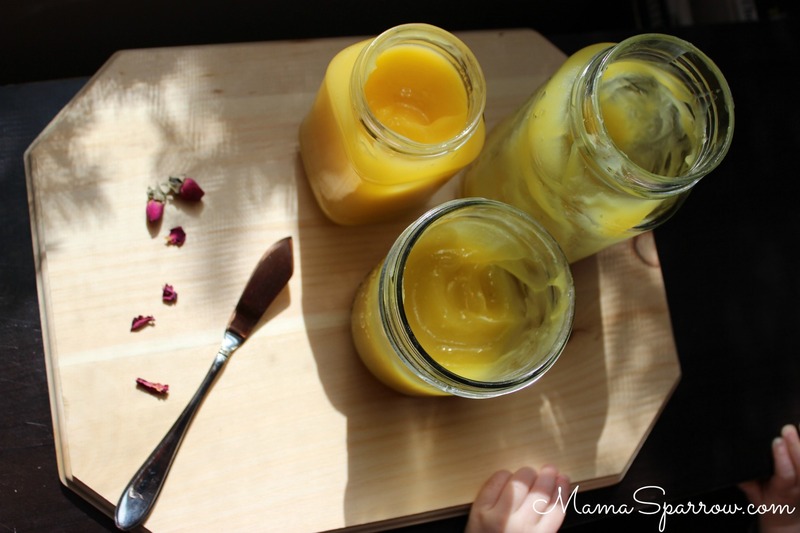 Finding myself surrounded with jars of citrus cream, I accepted the next challenge – how to use and eat them. I quickly expanded into learning to make tarts, as well. This lemon curd is a nice classic. It is more zest forward with just enough sweet to still enjoy eating it. My favorite ways to enjoy this cream is on my shortbread tart crust topped with fresh berries, slathered on a blueberry scone from Ambitious Kitchen, or stuffed in a breakfast crepe. I would love to hear how you use you curd. Be sure to share below in the comments and use #MamaSparrow on your social network. A classic lemon curd. I wanted to create a curd that would give a nod to the zesty zing of the lemon while offering just enough sweetness to enjoy the cream on any platform of choice. Cream the butter and sugar together in a stand mixer. Add the eggs and egg yolks one at a time mixing well. Blend in the salt. Slowly add the lemon juice as the mixer is going. Create a double boiler by filling a saucepan with about an inch of water. Place the mix in a stainless steel bowl that will fit atop of the saucepan or leave in your stand mixer’s stainless steel bowl. Bring the water in the saucepan to a simmer. Place the stainless steel bowl with the mixture atop the simmering saucepan. Constantly stir** mixture until the sugar is completely incorporated and the curd thickens. This should take about 10 minutes. Remove the bowl from heat and place on a hot pad holder. Continue stirring the mix for several more minutes as it cools. The mixture will thicken more as it cools. Your curd will keep in the refrigerator for about 1 week and in the freezer for 1 month. *Dairy free and soy free: replace the butter with a soy free vegan option. My favorite is Earth Balance soy free vegan buttery sticks. **Note about stirring Stir constantly. Use a spoon or spatula. Avoid using a whisk as that would create air in the mixture.